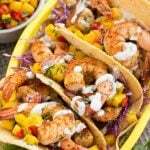 These shrimp tacos with mango salsa are a quick and easy dinner option that features tender shrimp, sweet and tangy mango salsa, and creamy cilantro lime sauce, all inside warm corn tortillas. This is the ultimate way to do taco night! 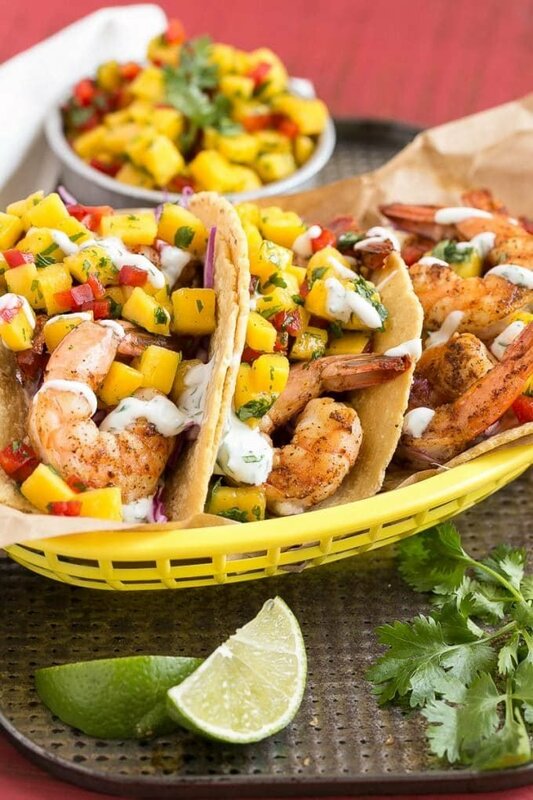 The fresh mango salsa is the perfect counterpart to the spiced shrimp and creamy sauce. If I ask the girls what they want for dinner the answer is always tacos. They are on a major taco kick right now which I don’t mind because it’s a quick and easy meal to make. I too love tacos and I was looking for something a little more grown up than the ground turkey/cheese/hard shell tacos that the kids love. 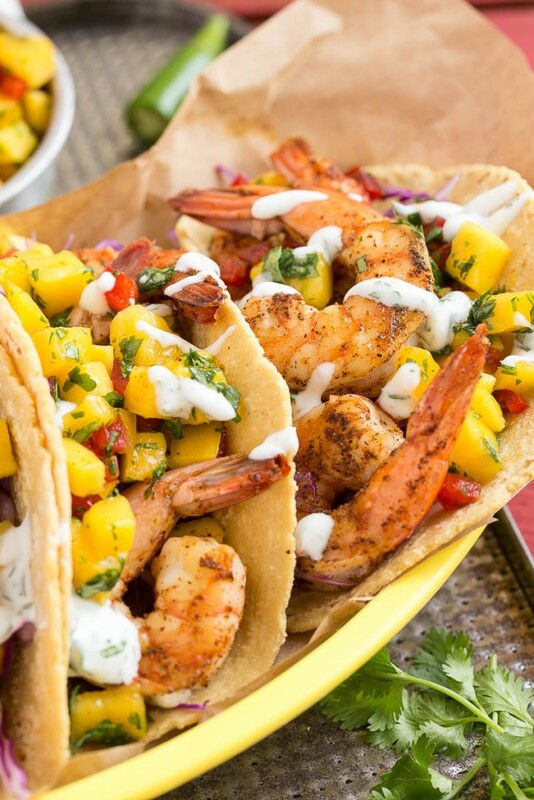 Enter these shrimp tacos with mango salsa – chile seasoned shrimp, crunchy cabbage, sweet and tangy mango salsa and creamy cilantro lime sauce makes for an awesome flavor combination that everyone will love. The shrimp in these tacos are lightly seasoned with chili powder and seared for a few minutes in a blazing hot pan until they’re cooked through. I used a larger shrimp here (size 21-25 per pound), but smaller shrimp will work just as well. This fruit salsa features fresh mango, red pepper, lime juice and chopped cilantro. The mango salsa can be made in advance and includes a little bit of fresh jalapeno for a kick – if you’re sensitive to spicy foods, make sure to take the ribs and seeds out of the pepper to considerably tone the spice level down. The purple cabbage adds color and crunch, I love a little texture in my tacos to keep things interesting. The tacos get finished off with a drizzle of cilantro lime sauce, which comes together in about 5 minutes with the help of a food processor. The whole meal can be made in about 25 minutes, not too bad for such a delicious end result. 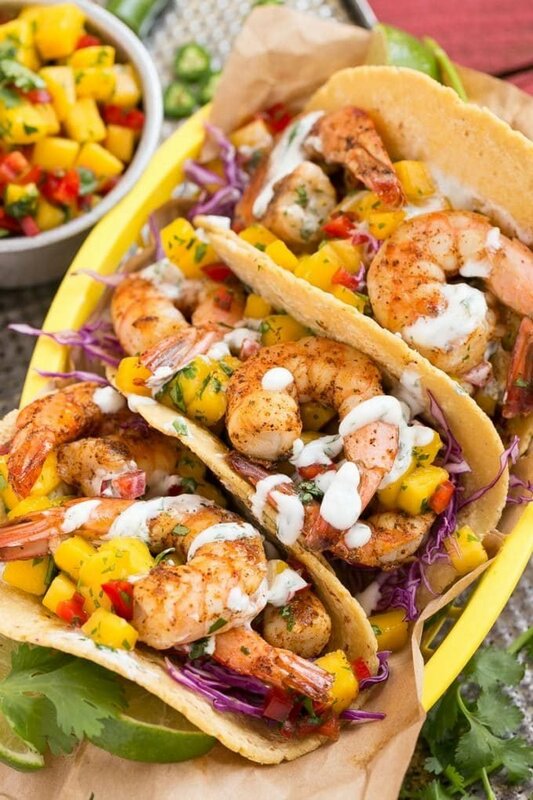 The next time the girls ask for tacos, I’m making them their usual favorite and throwing together these shrimp tacos with mango salsa for the adults in the house. Don’t forget to make my mexican rice and cantina beans to serve on the side! For the mango salsa: Combine all the ingredients in a bowl, add salt to taste. Cover the bowl and place it in the refrigerator for at least 15 minutes, up to 4 hours. For the creamy cilantro sauce: Place all ingredients in the food processor; process until sauce is smooth and creamy. Add salt and pepper to taste. To serve: Warm the tortillas. Add a spoonful of sauce, a handful of cabbage and place the shrimp on top of the cabbage. Top with mango salsa and serve immediately. Make Ahead: The mango salsa and cilantro sauce can be made up to 4 hours in advance. Green salsa is salsa made with tomatillos instead of tomatoes, it’s sometimes also called salsa verde. If you go into the salsa section at the grocery store you should see jars of green salsa alongside the red salsa. Hope that helps! It would be such a pain to bite down into the taco and actually bite on one of the shrimp tails…. The recipe says to remove the tails, leaving them on was a photography styling decision on my part. I am making these taco tomorrow for dinner. Can’t wait! “The shrimp in these tacos are lightly seasoned with chili powder and seared for a few minutes in a blazing hot pan …” <— made my mouth water…. What time is din din?!? Hands down the best shrimp tacos I have seen. They look SO flavoursome. just wondering ..do you eat the tails of the shrimp? Nope, you don’t eat the tails – I just left them on for photo styling purposes :). I’ll update the recipe right now to reflect that, thanks! Your tacos are absolutely gorgeous! Almost too pretty to eat! Shrimp and fish tacos are one of my favorite meals…I need to try this! These photos are seriously stunning, Sara! So vibrant! Loved this recipe!! I always ask for shrimp tacos on restaurants and now I feel all fancy because with this I can make them at home! OMG…the mango with the shrimp…PERFECTION! Absolutely gorgeous! I need that salsa stat! I love tacos and we just about have them every week. Usually it’s chicken, pork or beef, but I definitely want to put shrimp into the rotation. They are absolutely gorgeous and I love the purple cabbage – such great crunch! Your shrimp tacos look amazing. I am especially admiring your photos and the symmetry of cut in the mango pieces. Nice job! Great flavor combination! Absolutely gorgeous photos, too! These look delicious! Bursting with flavor! I love the combination of mango salad with shrimp!! gorgeous pictures! I could eat these every.single.day. These are some of the most gorgeous shrimp tacos I’ve ever seen! I just love shrimp and mangoes together. Yum! These look so good! Certainly a huge step-up from taco kids. 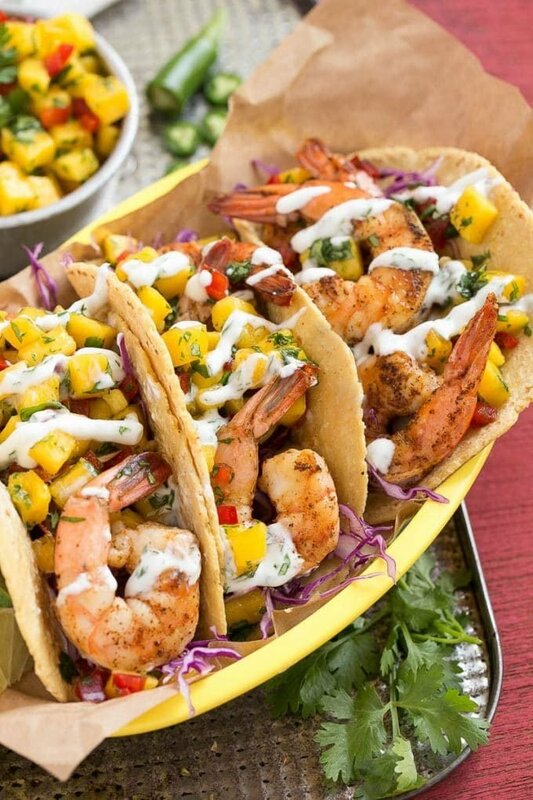 I love the looks of the cilantro lime sauce drizzled over the shrimp and mango salsa. Yummy! 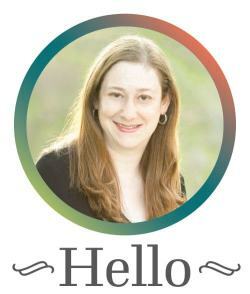 These look incredible – I couldn’t pin this fast enough! My mouth is watering just looking at this! This is easy enough to make but a little more “fancy” then a regular taco! Love it & all tha flavours incorporated!